Nobody in Loyendi village keeps track of time. But for its 150-odd residents, December 7, 2012, is a day to remember. “It is our independence day,” says village elder Petra Kanhara. On this day, the village in Odisha’s Kandhamal district got community right over 20 mountains full of forests under the Forest Rights Act (FRA). “Now, the forests and their produces are rightfully ours,” he smiles. Till now, paper mills had exclusive access to the vast bamboo resources the mountains have. Back in 1967, people of Loyendi, most belonging to the Kondh tribe, became encroachers on their own land when the Odisha government declared the surrounding forest as reserve forest. The government had abandoned them, they felt and wondered why the forest they worshipped so ardently was being snatched away from them. FRA, introduced in 2006, proved to be the gamechanger. Its two provisions turned the story around. The Act gives communities the right to protect and manage forests under traditional use. It also allows communities to own, manage and sell bamboo, which it calls a minor forest produce. FRA recognises rights for settlement and farming in forest areas, and community rights over minor forest produce. In 2009, all the residents of Loyendi got individual settlement rights. The turnaround was not easy. The community had to fight an intense battle with the mighty forest bureaucracy, and a paper mill major employed exclusively by the Orissa Forest Development Corporation (OFDC) to procure bamboo from these forests. Loyendi residents worked in these forests as bamboo cutters, earning Rs 30 in a day. The paper mill, on the other hand, was procuring bamboo at throwaway prices—Rs 180 for a tonne, or 2,400 metres, of bamboo. At the local market, one metre fetches Rs 20. The forests sustain the domestic needs of 25 other villages, besides helping close to 1,000 artisans. “Years of bamboo harvesting by the paper mill had depleted the forests. We were looking for an opportunity to protect them while earning from them,” says resident Bal- krishna Kanhara. But even in 2011, five years after FRA was implemented, nobody knew about its provisions. The forest bureaucracy opposed FRA and took no step to popularise it. The campaign by non-profit Vasundhara to sensitise the community on FRA worked to people’s benefit. “The first thing we decided to do was stop the paper mill from taking away bamboo from the forests,” says Binayak Kanhara, president of the forest rights committee, the nodal body to implement the Act in the village. Priedi village in Odisha’s Kandhamal district has a new set of rules, says panchayat head Bishnu Charan Malik. Immediately after the village got community right over the surrounding forests, its gram sabha announced that responsibility of dousing forest fires now rests on each resident of the village. A five-year ban has also been imposed on sale of bamboo shoots. “The paper mill would denude our bamboo forests. We, too, were hampering regeneration by taking away the shoots,” says Malik. “This new forest management plan has already been implemented. But we do need to get it officially approved,” he says. For a village that made a large part of its earnings from bamboo shoots, will sustainance not be difficult? To compensate the loss, Malik has pushed for Rs 20 lakh worth of works under the rural employment guarantee programme. This will ensure Rs 25,000 to each resident per season for the next five years. By this time, the bamboo bushes would have grown enough to sustain the village. On January 25, 2011, the gram sabha wrote to the divisional forest officer (DFO), saying it was illegal for the paper mill to cut the bamboo. The DFO shot back, saying there was no official recognition of the village’s community right under FRA. A heated exchange of letters ensued. The forest department argued it had the right to allow harvesting in the forest until the community right was claimed and recognised. “The paper mill officials tried to bribe me. When I refused, they threatened me of physical harm,” says village sarpanch Bishnu Charan Malik who has been instrumental in getting community rights to many villages in his panchayat. On January 31, the gram sabha wrote to the state-level monitoring committee of FRA, which is headed by the state chief secretary. After this, the response was smooth: forest officials came to Loyendi. After a four-hour discussion, government ordered the paper mill to stop harvesting bamboo. The paper mill winded up in a hurry, leaving behind some 40,000 clumps of bamboo. In February, the village was drafting its community forest right (CFR) claim. Loyendi became the first village in the state to get its community claim title over customary forests by using the traditional tribal system of forest demarcation called sandhi. The message from this unheard of village now echoes in Kandhamal’s forests, covering close to 90 per cent of the district’s area. Step into any patch of forest here, one will find a community that owns and manages it. 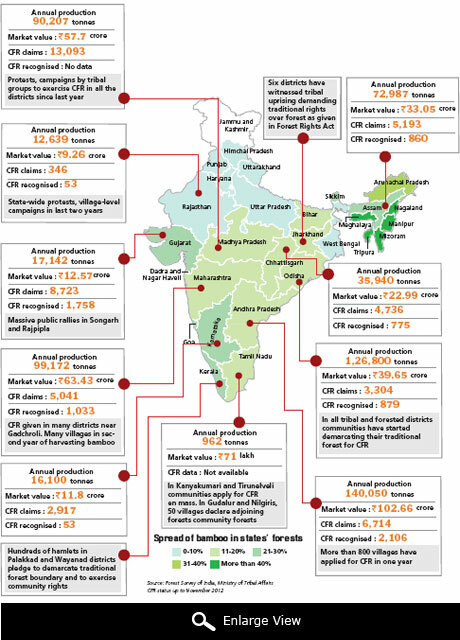 Of the 2,415 villages, 1,907 have got CFR over 57,880 hectares of forests, the highest in the country. Within months, seven villages near Loyendi managed to stop the paper mill from harvesting bamboo. Another 25 understood the importance of FRA which gives people the right to own, manage and sell bamboo. Bamboo cutting almost stopped in the district. The state’s chief conservator of forests rushed to the villages and requested people to allow bamboo harvesting, but the people refused. The paper mill had to withdraw from the district in March 2012. “The surge in demand for this right is dominantly community-driven,” says Jitendra Kumar Sahoo of Vasundhara. “We expect some 10,000 CFR claims the next year,” says Santosh Sarangi, commissioner, tribal affairs. “Community right is a great economic and livelihood incentive,” he adds. People couldn’t agree with him more. Bamboo is an incentive for local communities. “Whether we sell it or we don’t is another matter. That bamboo has become our resource is reason enough for villages to claim community right over forest,” says Rabindra Kanhar, resident of Priedi village, the second village in Odisha’s Kandhamal to get CFR (see ‘New jungle rules’). “Within a year of getting the right, there is significant inflow of money to the community. Remember, we have not abused the forest,” says Trinath Patra, president of Kalahandi Jungle Mancha, a district-level federation of forest-dwelling people. 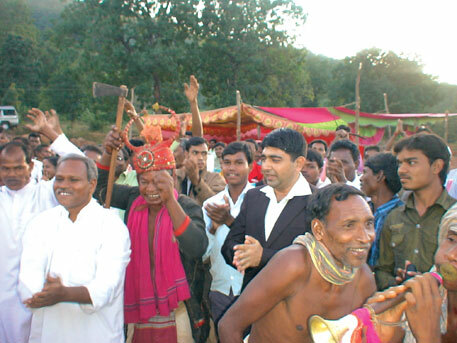 Jamguda in Kalahandi was the first village in Odisha to get community rights over 49.7 ha of forests, in 2010. Jamguda came into prominence in June 2012 when forest officials stopped Member of Parliament Bhakta Charan Das from taking away a few pieces of the first harvest of bamboo from the village. Now as bamboo flowers, Jamguda’s gram sabha has taken up selective harvesting. Bamboo is of no use once it flowers. “Within six months, Jamguda has earned Rs 20,000 from selling bamboo locally. The forest department still does not allow transport of bamboo outside the village,” says Nilambar Patra, president of forest rights committee. With the forest under community control, life revolves around it. For the first time the village has its own development fund. “This is how community control over forest will unfold: development without destruction,” says Das. It’s not just communities living in the forested areas of Odisha that are excited about managing their own forests. There has been a surge in claims across the country (see ‘Rush for bamboo’,) ever since April 2011, when Jairam Ramesh, the then environment minister, gave transit passes to the people of Mendha Lekha to transport bamboo. Mendha Lekha in Maharashtra was the first to get community forest rights (CFR) in 2009. Between April 2011 and November 2012, about 14,000 claims have been made. But the village could exercise its right after a long battle with the forest bureaucracy. The forest department had conveniently misinterpreted the definition of minor forest produce (MFP) under the Forest Rights Act (FRA). It said people had the right over MFP, which includes the lucrative bamboo and tendu, but could not use them to make monetary gains. A change in forest regime is happening in bamboo forests, which is the world’s largest. 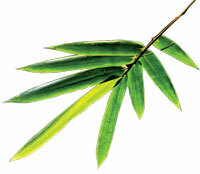 Bamboo occupies 13 million hectares of India’s forested area, Forest Survey of India estimates. The total bamboo growing stock is about 169 million tonnes. According to the Planning Commission, the country’s domestic bamboo economy is worth Rs 2,043 crore. By 2015, it will reach Rs 26,000 crore. Terms like “sample plot”, “felling cycle” and “compartment” are household words in Pachgaon. The village in Maharashtra’s Chandrapur district got community forest right title in May last year, but the forest department denied its people the right to harvest bamboo. No felling can take place without a working plan, officials told people. Residents, with the help of non-profit Paryavaran Mitra, swiftly prepared their own working plan, got it reviewed by the divisional forest officer and sent it to the chief conservator of forests. “The process is simple but the forest department makes it sound difficult,” says resident Mahadev Tekam. 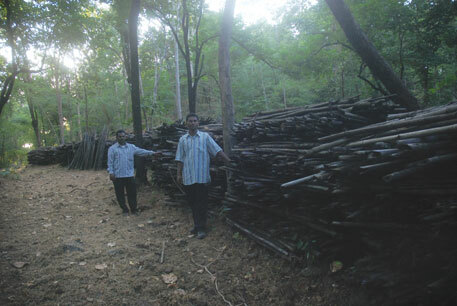 The village felled 7,000 bamboo, but could not sell them because the gram sabha did not have PAN card. It has applied for it now, and plans to fell 700,000 bamboo in 2013. The gram sabha has resolved it will sell bamboo through open tender. “We have estimated the felling and trade expenditure of one bamboo to be at Rs 23. We will keep the floor price at Rs 30,” says resident Jagnnath More. 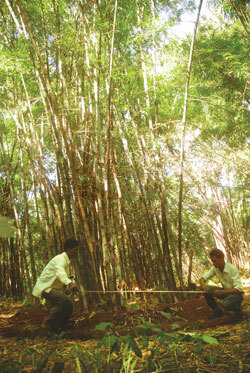 To take maximum benefits from bamboo, Pachgaon is also developing an innovative model. “Instead of selling raw bamboo, the village will make sticks for incense-stick makers from the next year,” says Vijay Dethe of Paryavaran Mitra. “If a raw bamboo fetches Rs 30 at the expenditure of Rs 23, a processed bamboo for incense sticks can fetch Rs 48 at the expenditure of Rs 35,” says Dethe. In September 2012, the Ministry of Tribal Affairs amended the Forest Rights Act (FRA) rules after several campaigns pointed out its ambiguity. FRA did not specify how villages would manage forests after CFR was granted. The new rules give gram sabhas the authority to issue transit passes and prepare conservation and management plans for forest resources after their rights over the resources are recognised. It mandates that the administration cannot arbitrarily reject forest rights claims. All villages with forest-dwellers must get forest rights related to protection, regeneration and management of community forest resources. Now that many villages have received CFR, people have evolved fascinating village-level forest management plans. Villages of Odisha and Maharashtra have already enforced management plans for forests. Loyendi, Priedi and Jamguda in Odisha have taken up community-driven forest fire control activities (see ‘On managing mode’). Mendha Lekha has collaborated with the government to transfer the rural development fund directly to its gram sabha for watershed development in bamboo forests. Pachgaon in Chandrapur district has its own management plan (see ‘Complexities simplified’). “This will revive forest communities’ traditional practices,” says Bhubaneswar-based forest rights activist Sudhanshu Sekhar Deo. “Now that rules have been clarified we expect community to assert its right,” says V Kishore Chandra S Deo, Union Minister of Tribal Affairs. But people have tough challenges ahead. First, most bamboo forests have paper mills as captive market. In fact, government has drafted policies that favour paper mills. In Odisha, 98 per cent of the extracted bamboo goes to paper mills. In Maharashtra, 66 per cent of the bamboo forests are controlled by just one paper mill. Sixty per cent of the bamboo in Madhya Pradesh and Chhattisgarh are supplied to paper mills. The rest is auctioned for commercial purpose. “The challenge for the community is to look for a captive market as big as paper mills. I don’t think paper mills will come to the community because prices will definitely go up,” says Santosh Sarangi, commissioner, tribal affairs. Second, communities, which have no government support, are not well equipped to handle this new business. And lurking around are stakeholders ready to manipulate the market. In the only district trying to do business in bamboo in the new regime, manipulative stakeholders are all out to claim their share. On December 25, Down To Earth secretly recorded an unusual meeting on the outskirts of Gadchiroli in Maharashtra. Bamboo contractor V K Anand was addressing 200-odd people: “Tendu market has crashed to an all-time low this year. The rates have fallen to half in many states. Do not worry if you do not get a good price. Rates keep fluctuating. You can make up for the loss in the coming years.” Anand tells them about a new auction mechanism for tendu leaves, also a minor forest produce, as people listen to him stupefied. Bamboo is the new money plant for Jamguda. The village in Odisha’s Kalahandi district got community right over a patch of forest that has nearly 200 bamboo bushes. Each bush will yield 50 clumps of about six metres. But there is a problem: all of this bamboo is getting wasted. “Bamboo worth Rs 40,000 flowered and died,” says Nilambar Patra, president of village forest rights committee. “The forest department is responsible for this. It did not allow bamboo to be transported out of the village,” he says. 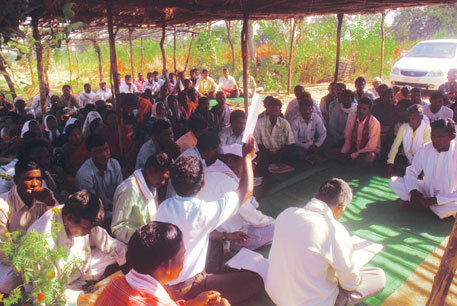 As a solution, the gram sabha decided to sell bamboo in and around the village. A bamboo cutter gets Rs 3 for each bamboo sold at Rs 25. The rest goes to the village development fund, which is used to conserve the forest. Artisans get it for free. The gram sabha also decided to close the forest protection committee, set up under the Joint Forest Management programme where forest officials play the key role. “It is our responsibility and freedom to manage the forest,” says Patra. “We have done it for bamboo. We will do it for tendu, too,” Anand ends his speech gaining people’s confidence. Within no time, he orchestrates a 10-member committee which will auction tendu leaves on behalf of more than 115 villages. Soon, a leading regional newspaper publishes a tender notice under Anand’s name inviting bids for advance sale of tendu leaves from these villages. The notice states that gram sabhas of these villages have authorised him to do so. Legal experts say only a gram sabha committee can perform functions related to management and sale of forest produce. No one outside the gram sabha can be a member of this committee. Following strong reactions, on January 5 people saw two notices in the morning newspapers—a public notice by the deputy conservator of forests of Vadsa division, and a modified version of the tender notice. The bamboo contractor shifted from Madhya Pradesh to Gadchiroli in 2011 when Mendha Lekha got its community forest rights title. In the absence of other buyers, the village directly sold all its bamboo to Anand. The next year, six villages harvested bamboo. All of it was bought by Anand. While Mendha Lekha sold bamboo through competitive bidding and got a price higher than last year, the other five villages sold bamboo without tenders on Mendha Lekha rates. Some activists feels people were misguided. “The contractor colluded with a few village leaders to strike the deal. Had people opted for tenders they would have earned much more,” says an activist who did not wish to be named. When Down To Earth visited some of these villages, it found people were not aware of the profits their gram sabha had made from bamboo sales. “Gram sabhas did not want to sell bamboo through tender because they think it is a problematic process,” says Anand. Vajirao Usendi, village leader of Rekhatola, went a step ahead and said law prohibits auctioning of bamboo. Anand foresees a promising business future in Maharashtra where villages are making a beeline to claim CFR. Till now, 786 of the 1,600 villages in Gadchiroli have got their forest rights recognised. Of the 115 villages Anand is helping auction tendu leaves, bamboo will be harvested in 15. Anand claims he is still negotiating with people for bamboo trade, but village leaders say at least three gram sabhas have already agreed to sell bamboo to him. “Trade is new for us,” says Shivaji Narote, resident of Marda, the first village to get community forest right title along with Mendha Lekha. “We wanted to study the prices and the entire tender process before getting into the trade,” he says. But when the gram sabha wrote to the district administration in March, 2012, to guide them on sale, purchase, rates and tender process of bamboo, it, characteristically, did not respond. So people reached an agreement with Anand to sell him the bamboo. When they geared up to begin harvesting, another hurdle came their way. The forest department had given CFR title for the compartment they were planning to harvest to the neighbouring Jhillar village as well. People of both the villages wrote to the forest department asking for demarcation of territories, but the department took no action (see ‘Delay tactics’). Even as people of the two villages were staking claim over bamboo, a third claimant emerged. In February 2012, the country’s largest paper manufacturer, Ballarpur Industries, started felling in the forest without consulting the people of Marda. In 1968, the Maharashtra government had leased most of its bamboo to Ballarpur Industries. In November 2011, the forest department gave the paper mill permission to fell bamboo in all the patches ready for harvest. This included many villages which had received community forest rights. People of Marda wrote to the forest department to stop the paper mill from felling in their forest. When the department did not respond, people forced the paper mill workers to stop the felling and seized the harvested bamboo from the paper mill. Despite this extraordinary feat, the village could not sell the bamboo because the contractor did not come to collect it. “We had asked Anand to buy the bamboo that we had seized from the paper mill as well. But he refused, saying it was of poor quality. He also kept delaying the harvest till the rainy season. The gram sabha had to finally cancel the agreement,” says Ramesh Koram, secretary of Marda gram sabha. Apart from Mendha Lekha, at least 10 villages were issued transit passes to harvest and sell bamboo. Of these, only five managed harvesting. The rest ended up relinquishing their rights to Ballarpur Industries. All these villages had sought the district administration’s help to harvest and trade bamboo. When the administration did not respond, people stepped back. Sources say there was pressure from Maoists to allow the paper mill to harvest bamboo (See ‘Bamboo under seige’, Down To Earth, March 31, 2012). Marda faced similar pressure but stood firm in exercising its right to stop the mill from felling its bamboo. That year, the paper mill harvested a large quantity of bamboo, says an activist. “Fearing it might not be allowed to harvest in community forests from the next year, the paper mill cleared the forest, leaving no scope for regeneration,” he says. After protests from civil society, the district collector issued an order in April last year cancelling all government leases and contracts in CFR areas. But this has not improved the situation. In Korchi and Kurkheda tehsils of Gadchiroli many villages had refrained from harvesting last year. “None has taken any step to harvest this year either,” says Keshav Gurnule of non-profit Shrusti. “Last year, it was the paper mill and the contractors. This year it could be just contractors,” says a source in the government. Nothing here happens without support or pressure from Maoists, he says. “Not all gram sabhas are as empowered as Mendha Lekha which withstood all kinds of pressure to manage its forests with utmost transparency,” says Devaji Tofa, community leader of Mendha Lekha. Meanwhile, Marda, along with Karsi, Suimara and Jhillar villages, has written many letters to government officials seeking guidance on bamboo trade, but got no response. District collector Abhishek Krishna expressed ignorance about the letters. “It is difficult to address these issues in each village,” he says. The forest department’s strategic silence smacks of conspiracy, says Mohan Hirabai Hiralal of non-profit Vrikshmitra. It conveniently evades responsibility to help villages harvest and trade minor forest produces, and is accumulating cases to show that gram sabhas cannot manage forests, he says. 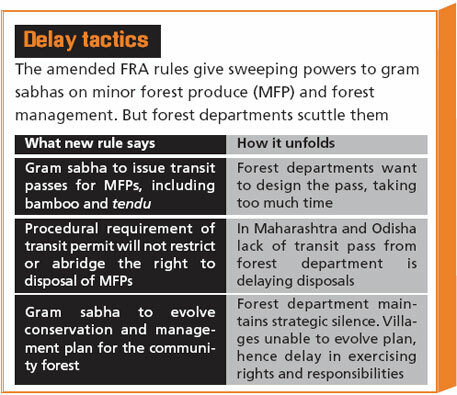 Ambiguity in FRA had made it easy for the administration and the forest department to wriggle out of responsibility. “Most villages received titles when FRA rules were not amended and there was no clarity on community forest rights,” says Sanjay Upadhyay, lawyer and legal consultant to the ministry of tribal welfare on FRA. Many did not even form committees to protect and manage community forest resources. Issues of rights and responsibilities of gram sabhas were not touched, he says. Amendment has not cleared the confusion totally. Government has monopoly over tendu leaves in all the states, either directly or through its corporations. Contractors buy tendu leaves from government in return of royalty, while forest dwellers earn daily wages for collecting the leaves. The Forest Rights Act renders this illegal by recognising the right of forest dwellers to own, manage and sell minor forest produce. But till now, no village, except those in Gadchiroli, has taken the initiative to sell tendu leaves. “A strong lobby of contractors, in collusion with bureaucrats and beedi-makers, has kept royalty and wage rates of tendu leaves much lower than the market price,” says Sharachchandra Lele of non-profit Ashoka Trust for Research in Ecology and Environment. “It is a well established system that works in the favour of both the businessmen and the forest department,” he says. “The gram sabha fears if it decides to auction tendu leaves, contractors may decide among themselves not to buy from it or bid low,” he adds. Also, there in an unsaid understanding that in places like Gadchiroli Maoists claim a share of the benefit. “Nobody can enter in this trade without their (Maoists’) support,” says a Gadchiroli resident not wanting to be named. Villages like Mendha Lekha, which inspired the fight for minor forest produce, are treading cautiously. “Tendu leaf market is complicated. If contractors collude, there is no support mechanism to help gram sabhas. Besides, government has done nothing to empower the gram sabha in this trade,” says Mohan Hirabai Hiralal who has worked with the communities in Mendha Lekha. There are issues that still need to be solved, says Ashish Kothari of non-profit Kalpavriksh. It must be found how gram sabhas can ensure equity and sustainability in forest management. Besides, the district administration must take responsibility when people seek help in the new trade. “In none of the rules or guidelines is there any mention of the forest department’s role,” he says. The administration, on the other hand, is seeking an easy but flawed way out. “It is essential that the forest department is engaged in the entire process,” says Abhishek Krishna, district collector of Gadchiroli. “If a forest guard is made a member of the gram sabha committee, he can guide the gram sabha on sustainable management. The administration can make the forest guard accountable if anything is amiss. The gram sabha can also introduce a talathi (revenue staff) or a gram sevak in place of forest guards,” he says. “But that would be illegal,” says Madhu Sarin of non- profit Campaign for Survival and Dignity. “Law does not provide for anyone other than a gram sabha member to be part of its committee”. “Even if the forest guard, who is at the lowest level of the machinery, enters in the committees, he will have most of the control. This is what happened in Joint Forest Management,” adds Kothari. The forest department should work as an advisory body to the gram sabha and provide technical inputs the way the agriculture department helps farmers. The environment ministry should issue a circular in this regard, Kothari says. Upadhyay informs that as per FRA gram sabha can complain to the state-level monitoring committee if any government department does not cooperate with it. The committee will have to respond within 60 days, he says. Thanks for Covering the very timely relevant story in Down to Earth for mainstreaming the understanding on assertion of rights by Gram Sabha over Bamboo. I am really glad to see your initiative to highlight this kind of good practices as example of community empowerment under an empowering law (FRA). My long association with this process making me excited to see this as learning for others to adopt. I got a best experience ever that community has tremendous potential and wisdom which can change the system of governance than the generic arm chair intellectuals. I wish this piece of story of experimentation would sensitize larger audience, forest rights activists and people in the system. Thanks for covering such a wonderful story on Minor Forest Produce, focusing on Kendu Leaves & bamboo post FRA. Forests and NTFPs as a natural resources were never meant to seen as a livelihood factors for the tribal people and other forest dependent communities in pre- and post-independence era. In colonial India, it was all about commercial exploitation and revenue and thus recognized no rights and concessions for forest dwellers. At the same time no protective legislation were enacted to focus on forest as a critical livelihood option. On the contrary they made it very clear that forest is primarily meant for commercial uses i.e, timber extraction and revenue maximization. But now the situation has changed. FRA has been proving the best weapon for the tribals and other traditional forest dwellers to restore their traditional rights over forest and forest product using their age old traditional knowledge. The road is open to eradicate poverty in just few years which the state has failed to do even in last sixty five years of our gaining independence. Gram Sabha has been empowered with most of the decision making process including the authority to issue Transit Permit. Now there is not to pay any fees, charges and even royalty on the Kendu Leaves, bamboo and other MFP that tribal and forest dependent collect, process, store and transport it to buyerÃ”Ã‡Ã–s destination to complete the sale. As rightly pointed out in the cover story better late than never... I am sure there will be more success stories like Kandhamal, Jamguda & Mendhalekha in the country. I could not able to contact Mr Kumar Sambhav as I was in field when he was collecting some information on Kendu leaves for this cover story. still the report is wonderful and hope Down to Earth would cover more such reports. Community rights are being vested to undo historic injustice. The goal is to handover management of the livelihood resources to respective communities. On one side, the people and activists are struggling to ensure the rights. And on other side, the vested interests joining hands and trying to grab the resources by any means. The responsible concerned departments like Tribal development, Revenue , Forest and Panchayat are not playing their role as specified in letter and spirit of the Act. The civil society organisations, environmentalists are not equipped to take challenge...The tribals and forest dwellers have got independence after long dark era! They should get every support to empower themselves and enjoy rights sustainably. We all should ask people on various posts constitutionally accountable for securing tribals' rights and their development. It was presumed that the forest people know about the forests better and will safeguard it. Now they are expecting the learned government officers belonging to British colonial department to support them. But it looks like there is a struggle going on for exploiting forest resources, for the industries.